YVES Saint Laurent once said that “dressing is a way of life”. However, choosing what to wear can be confusing and mistakes can be expensive. It is generally expected that a woman should have a sense of style and know how to dress. Truth is, most of us don’t. But there is so much more than just getting dressed. Style is an innate sense of what works together, an instinct, unfortunately, that doesn’t come naturally to all women. It’s the ability to mix and match different prints, patterns, textures and accessories to achieve an outfit that looks good. However, it is not a secret only available to a select few, it’s a matter of common sense and clever dressing. It’s the subtle art of layering, a concept that many women struggle with. Many women are afraid to layer their clothes for fear of looking bigger than they actually are. While logic would suggest that this is true, if you’ve mastered the art of layering this couldn’t be further from the truth. There is no right way or wrong way. It’s about adding interest, about creating a sense of drama. It’s also about confidence. Your success is measured by how creative you allow yourself to be. Remember that style is very different to fashion. Once you find something that works, own it. However, even the most creative need guidelines. 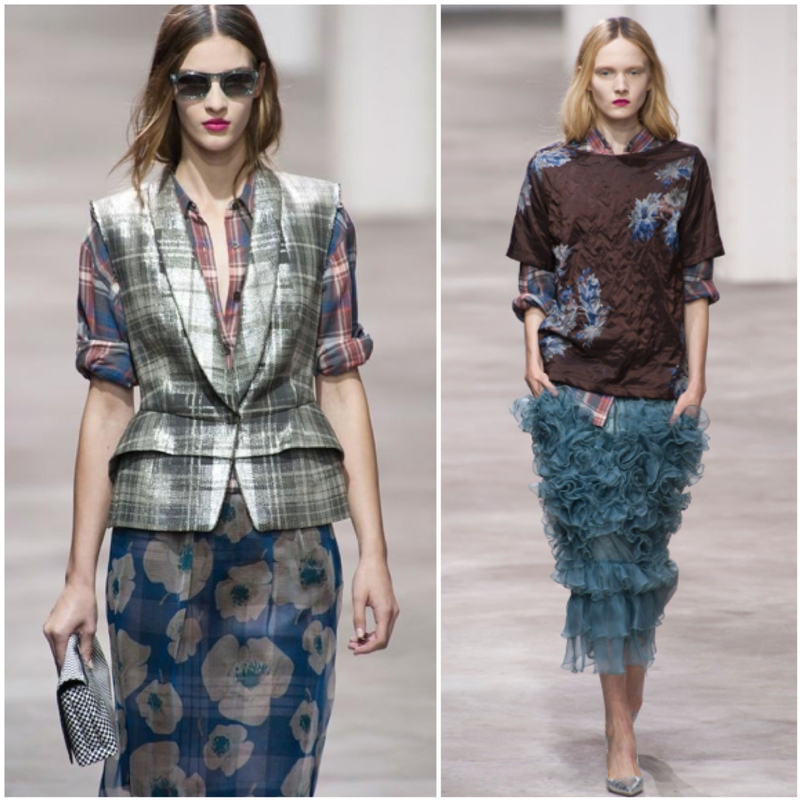 The master of layering, Belgian designer Dries Van Noten, champions the signature style season after season. Before you get started there are six things to consider to help you gain perspective: know your body; understand proportion; be confident with colour; understand prints and patterns; know your textures, and be strategic with accessories. But, most importantly, you need confidence. It’s the one thing that every woman needs. If you feel good in what you’re wearing, you’ll exude confidence. An outfit, no matter how on-trend, will never be right if it isn’t comfortable and doesn’t feel like you. But if you feel good in what you’re wearing, then you’ll exude confidence. And ultimately, that’s what we all want. So there is no reason you can’t be a style queen. All it takes is a little imagination, some experimentation and the passion to bring it all together. So be bold, be brave and be confident. Knowledge is power, right? 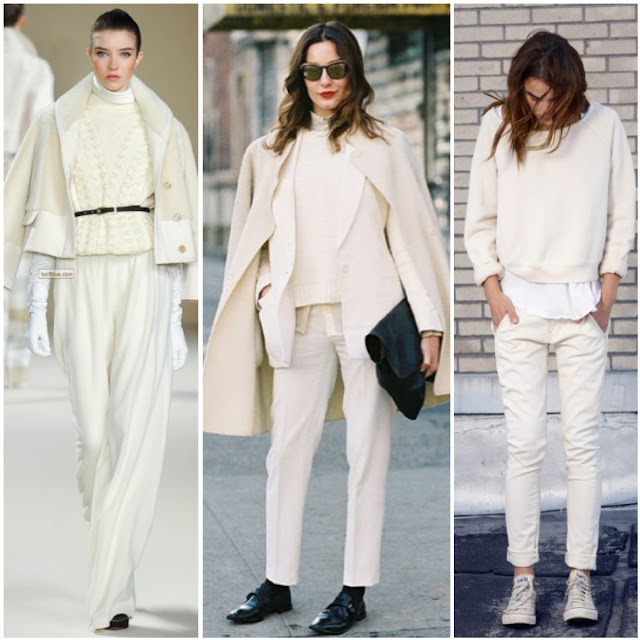 Classic white shirts provide a great base on which to layer up a selection of knits and coats. Before you head to your wardrobe, you need to know your body. 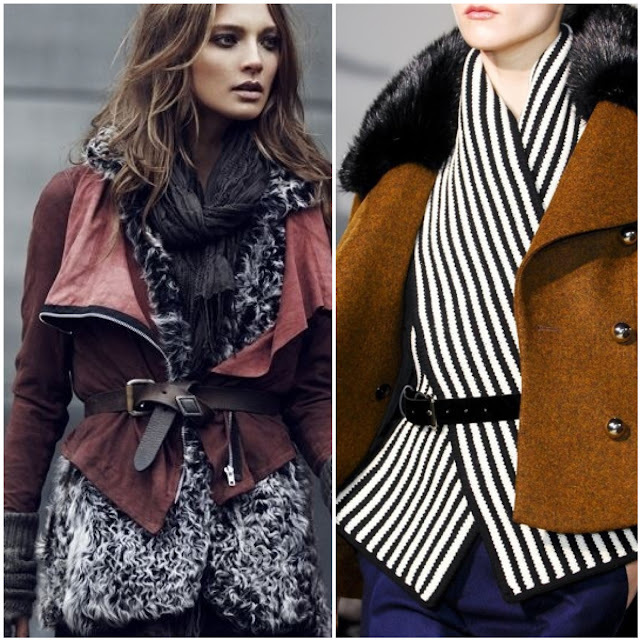 A perfectly layered look will complement your curves and create the illusion of a more proportional silhouette. First, what is your body shape? Are you bottom heavy or top heavy? Long body or short body? The list is endless and I’m not going to dwell too much on the whole body shape agenda here. But, most importantly, what you can’t eradicate you need to disguise or minimise. Second, what is your best asset. Is it your legs? Your neck? Your bust? Your waist? Or your bottom? And third, know how to look taller and slimmer. Know how to create a slim silhouette or elongate your body by creating a continuous vertical line, forcing the eye to travel up and down your body, not across – this adds width. Balance and proportion are paramount when layering. Think of your body as a triangle. Wider upper body + narrow lower body. Narrow upper body + wide lower body. Don’t swamp your body. You don’t want to add bulk. If you are bigger in the upper body and want to wear a voluminous or loose-fitting top, keep your lower body narrow. But if you have a large bottom, you want to cover or hide it. So your top should sit just below your widest part i.e. below your bottom. NOT above or halfway. If you want to wear an unfitted cropped jacket, make sure your undergarments are more fitted so as to keep your shape looking slim. Dress in halves if you are short and thirds if you are taller. Wear one colour head to toe. This is one of the most effective ways of elongating the body. However, consider breaking the look by wearing accessories in complementary colours, prints and textures. 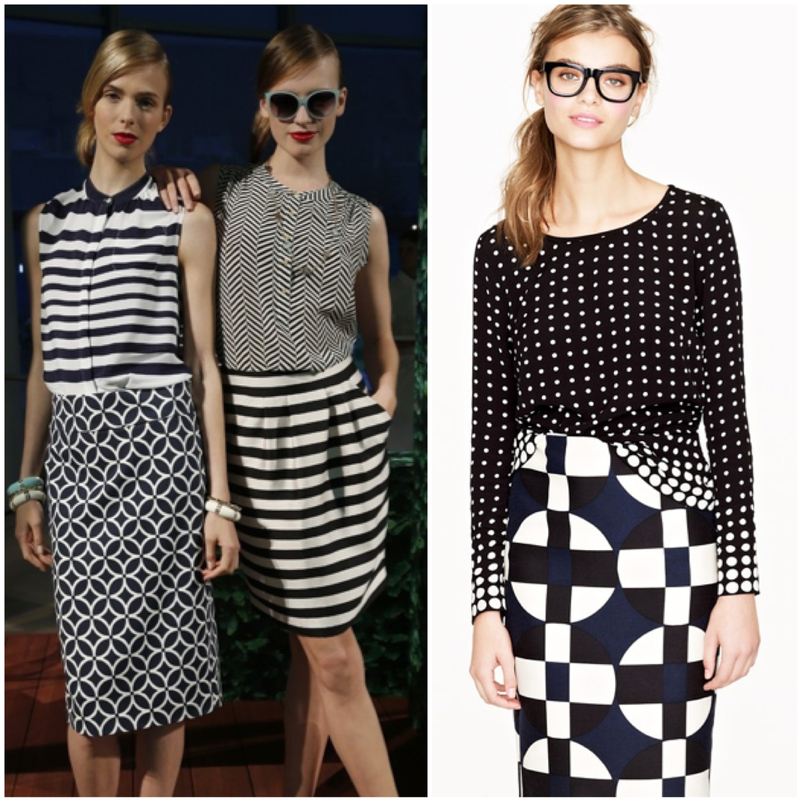 Or opt for tone-on-tone dressing. This means wearing a variety of tones or shades of the same colour. It has a similar lengthening effect as wearing one colour head to toe. Alternatively, try complementary colours such as black and white, navy and cream, green and blue, brown and orange, or pink and orange. They are classics because they work. It’s best to work only with two colours. 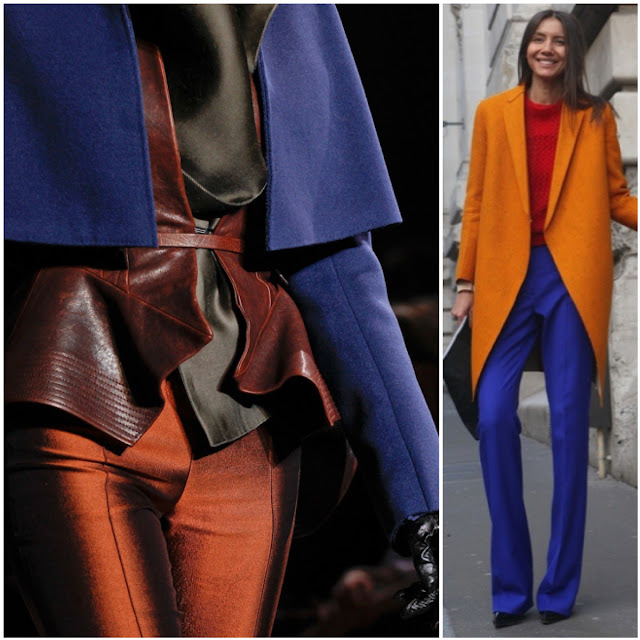 If you want to be really brave, try three colours or mix several brights together. Why not try pink, orange and cobalt blue. A light-coloured top with dark-coloured bottoms will always be more slimming than the reverse. This is because the eye is kept high with a pale or light-coloured top, reinforcing the vertical. So don’t feel the need to wear only dark-coloured tops if you’re heavier in this area. 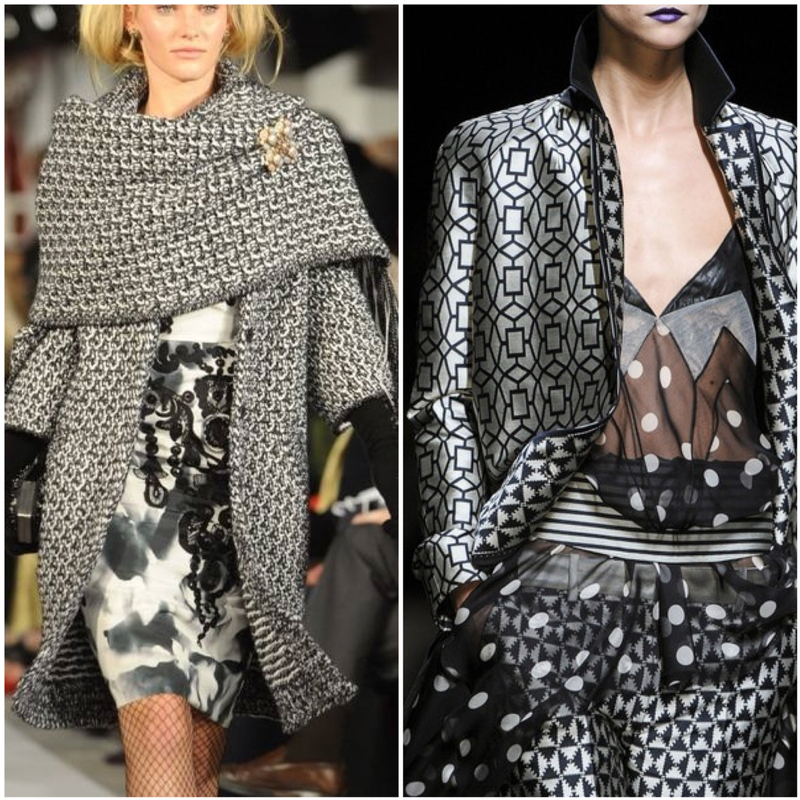 Mixing prints with patterns provides unlimited opportunities to really express your personality. Don’t be afraid to mix prints with patterns, spots with stripes, stripes with florals, graphic patterns and spots or florals with graphic prints. You can wear them all – with great success – provided the colour palette is the same. Consider it a form of tone-on-tone dressing. The key is to identify the base or background colour in your prints and patterns. But when it comes to accessories, choose one thing in that base colour (preferably a solid colour) – bag, shoes, coat, gloves, scarf – thus grounding or anchoring your look. But if you’re really confident, throw caution to the wind and run wild with abandon. The sky’s the limit! … chunky knits with fine knits, rough with smooth. The choices are endless. It’s best to incorporate a mix of materials when layering. By wearing the same fabric or texture, you’ll end up looking heavy and dowdy, which will give the appearance of unwanted weight as well. Add interest and surprise by mixing rough with smooth, matte with shine, sheer with solid, light with dark, soft with coarse. Think about the weave or construction of fabric. So mix large open-weave with finer tight-weave fabrics or sheer with solid. 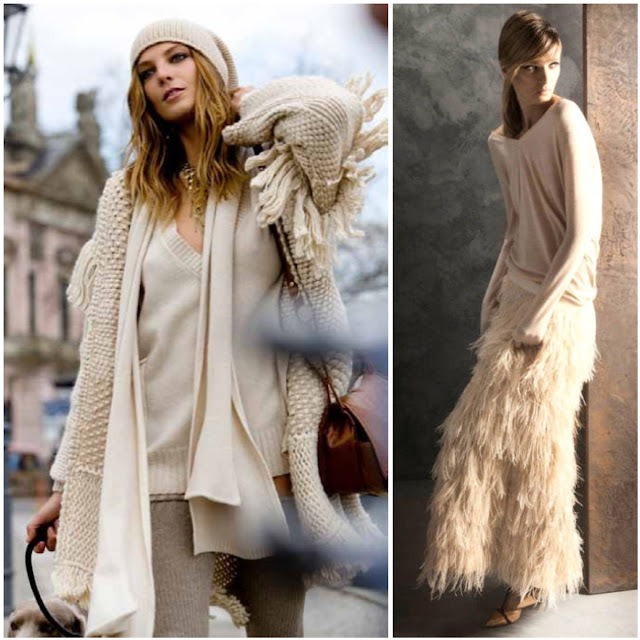 Pair a chunky knit with delicate silks and satins, or georgettes and chiffons. 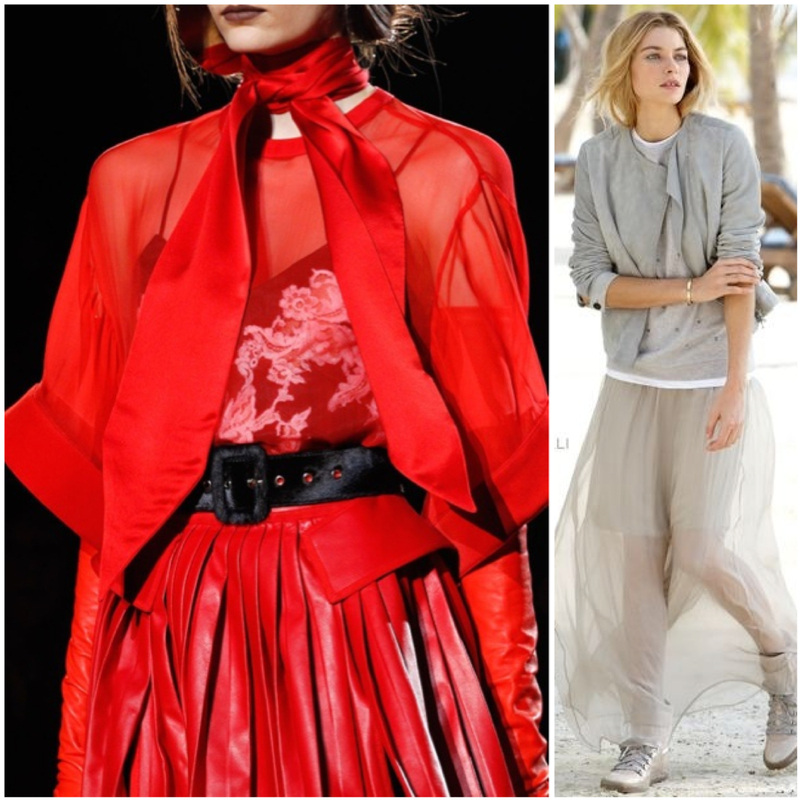 Sheer fabrics are an effective strategy to hide or minimise without adding bulk. Always remember balance and proportion. Then think attitude. The use of accessories continues the concept of creating a continuous vertical line, something you will want to consider if you plan on wearing lots of layers that add bulk. But think of accessories as essentials, not extra pieces. Scarves. Two long pieces that hang equally down the front of the body widens the body. Consider, instead, having one longer side than the other, or tie or wrap into one long piece. Necklaces. The same above applies to necklaces. Long strands elongate the body. Short necklaces create a horizontal line, something you want to avoid. Short necklaces that sit right around your collarbone look great if you are wearing boat necks, strapless bodice-style tops or dresses. Belts. Wear a belt. Regardless of shape or size, it gives the illusion of shape. Handbags. If you’re wearing a shoulder bag, keep the strap shorter so your bag sits under your arm. Don’t let it fall to your hip, as the extra bulk of the handbag only adds width at your widest part –your hips. Choose a tote or clutch instead. Bracelets. I’m a big believer in statement jewellery. But keep it simple. Opt for one piece that makes a statement rather than lots of little pieces. Choose either a necklace, or earrings, or bracelets. NEVER wear everything at once. Okay, so now you’ve got the basics sorted, it’s time to start styling. Start with a basic lightweight neutral-coloured top. Think classic and plain. Let your top garments do the talking. Add another layer such as a soft knit – cardigan or jumper – or a floaty overdress or top. This is also a great opportunity to introduce some colour to give your outfit personality or more interest and depth. Next add top layers such as a jacket or coat. Maybe try something in a base colour – look for classic neutrals such as black, navy or camel – or play with print or texture and colour. Finally, top off your outfit with accessories – scarves, necklaces or bracelets. But NEVER all of them. And finally, do as Coco Chanel once said. Before you leave the house, look in the mirror (preferably a full-length mirror) and remove one thing. Do you have a favourite way of layering certain garments? What’s your go-to look for layering? 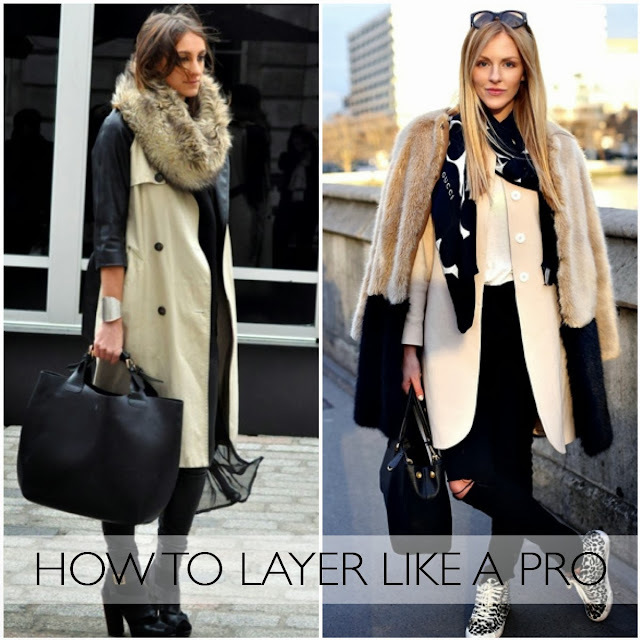 Not sure how to layer like a pro? Let me help solve your problems. Got a problem or a question, drop me a line. You never know, it could prompt another post!